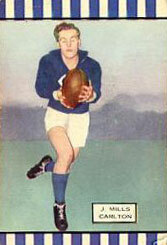 Mills played 124 games for Carlton after debuting in Season 1950. He was recruited from South Bendigo and kicked 128 goals for Carlton at a strike rate of over one per game. Unfortunately Jack's career coincided with one of the leaner periods in Carlton's history - in fact, he would only play in one finals match in his whole career with the Blues (1952 1st Semi Vs Fitzroy). Contributors to this page: Bombasheldon , pblue , molsey , WillowBlue and admin . Page last modified on Sunday 02 of June, 2013 20:46:02 AEST by Bombasheldon.